Starter wort, for the L. brevis and L.
Its almost time to brew a quick sour for the upcoming summer…which means that it is time to begin preparing starters of the lacto, sacch and brett going into the beer. Its been a few years since I blogged about brewing this kind of beer – a sour Berliner Weisse which can be ready in as little as 10 days – or which can act as the basis of more complex beers through the addition of Brettanomyces, fruit, herbs and blending with other beers. But more on that later. Today’s post is on a topic I get asked about with some regularity; namely, how to prepare a starter for Lactobacillus. A proper starter is especially important for sour worting, both to minimize the risk of infection by other bacteria, and also to ensure a reasonable souring time (a few days). The good news is that lacto starters are easy – almost as easy as yeast, but you do need a bit more equipment. As always, details are below the fold. The first step, as with growing any brewery organism, is to create a starter medium compatible with the lactobacillus. Unhopped wort makes an excellent medium, as does preservative-free apple juice – but if using apple juice you must add yeast nutrient to ensure sufficient nitrogen to support Lactobacillus growth. I personally prefer wort as I can dump the whole starter into a beer; Lacto doesn’t always sediment nicely during a cold-crash, so pitching the whole starter is often the best option. However, both of these media share a disadvantage – lacto growth is limited as the bacteria will readily acidify the starter, to the point where they inhibit their own growth. Moreover, depending on the strain of lacto, they may have a limited ability to eat the more complex sugars found in wort. If maximum lacto numbers are critical, MRS broth (a commercial microbiology medium) is your best bet. MRS is buffered such that this pH drop is minimal, and contains glucose as an energy source. My very minimal work with MRS has shown that I average 2-5 times more Lactobacillus when using MRS compared to an equal volume of wort. That said, the cost of MRS is easily 25x the cost of wort; sufficiently high enough that typically don’t bother using it. EDIT: in a somewhat serendipitous event, Sam of Eureka Brewing just put up a post comparing MRS to DME, apple juice and various other media options. Sour-worting or sour-mashing: I’ve used anywhere from a 250 ml to 2 L (2000 ml) starter when sour-worting a 5 gallon batch, using lacto pulled from my yeast-bank. The only apparent difference being the desired acidity was hit ~8 hours earlier with the larger starter. Typically, for a 20 L/5 gallon <1.040 sour-mashed beer, I use a 500 ml starter. If using a tube of commercial lacto for sour-worting I don’t bother with a starter. Rapid Sour Ferment: If doing a rapidly-soured beer using a mixed ferment, the pitch size is more critical – experiments conducted by Wyeast suggest you need a 5:1 lacto:yeast ratio if doing a fermentation-soured Berliner Weisse. You’ll have to do counts, using a microscope, to gain this level of control as there is no equivalent of starter tables (yet!) for Lactobacillus. Mixed Cultures for Long-Aging Sours: This is much more complex a topic, with the amounts of lacto required dependent on the beer style and other organisms present. For a mixed laco/sacc/brett/pedio culture I usually shoot for a 2:5:1:1 mix, and have found this works well. For a mix containing no pedio I shoot for a 5:5:1 mix. I have no evidence that these are the “ideal” ratios – the first time I made mixes like there I simply guessed at the ratios, and it worked, so I haven’t bothered mixing things up. That said, these mixes are quite forgiving when the beer is aged over long periods of time, so exact ratios are probably a waste of time to begin with. 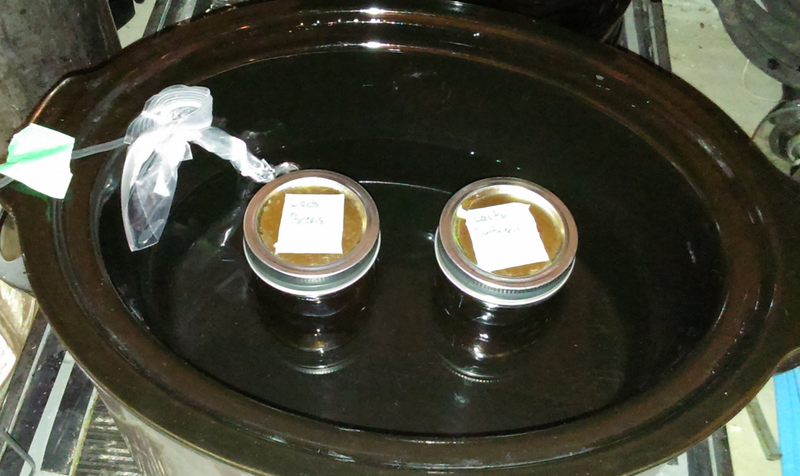 (top-left) is in a plastic bag and pressed against the side of the pot. Most temperature probes (e.g. the one which comes with the ubiquitous STC 1000) are not waterproof; place your probe in a plastic bag, and use twist-ties to hold it shut, to protect the probe. Make sure the probe is pressed against the side of the pot (i.e. measure the pot temperature) – this will help avoid large temperature swings. If you measure the water temp expect very large temperature swings – 10 C or more! Use the lowest setting on your pot to avoid over-heating; I’ve found the “keep warm” setting is the only one which works. Again, higher settings will produce temperature swings. should soon stabilize at the desired 38C. Set your temperature such that the maximum temperature of the pot doesn’t exceed the maximum temperature the lactobacillus will grow at – figuring out your temperature swings is mostly trial-and-error. 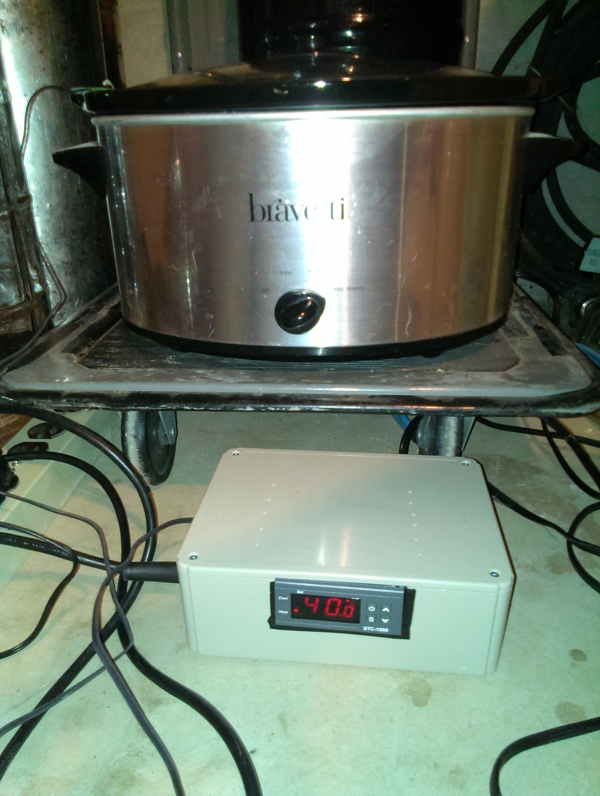 My crock-pot setup has swings of only ~0.4C, which is pretty good. As for the temperature you require, the exact temperature is quite strain-dependent.The Milk the Funk wiki has a nice write-up on this, including advice from both commercial sources and experiments conducted by Matt Humbard. The commercial sources generally recommend 95 F (35 C) for lacto starters, while Matt’s work suggests that 98-102 F (37-39 C) is optimal for most commercial strains. I typically run my starters at 38C (100 F), which is a good compromise for most strains. That said, if you have prepared your lacto starter from grain or another “wild” source, I would recommend temperatures of 40-42 C (104-108 F), as these temperatures will suppress the growth of other bacteria which can produce undesired off-flavours. So you’ve made your starter media, inoculated it, and it is bubbling away (or not, if your strain is homofermentative) – so how long do you go, and how to you pitch the starter? The length of is variable; ideally you should measure the pH and wait until it stabilized, but that runs the risk of infection. For starters from a slant, or frozen culture, or a grain-starter, I go the lazy route and simply let the starter run for 5 days – excessive in most cases, but it ensures a good yield. For a tube of commercial lacto, 24-48 hours is sufficient (as is a 1-2 L starter). In either case, don’t let it go too long – the lacto can literally poison itself with high acidity. Once the starter is done you have two options – firstly, you can cold-crash to sediment the lacto. In my experience this works about half the time, but it its a must for apple-juice or MRS starters (fermented MRS may very well be the most disgusting substance on earth). For sour-worting I use a wort starter, and throw in the whole ~1/2 L of starter. This will have a minimal impact on the ~20 L of wort in a 5 gallon batch – not only that, but the starter will acidify the wort somewhat, aiding in the suppression of other organisms. Once your wort is inoculated, what follows depends on how you’re preparing your beer. If sour worting or sour mashing, I let the lacto work for 2-4 days, at the same temperature as the starter, until a pH of 3.4 or so is reached. I then boil briefly to sterilize & hop the wort, cool, and pitch a good dose of the desired yeast. For mixed ferments I simply pitch the lacto (and yeast/etc) at the desired fermentation temperature. Many people pitch the lacto a few days in advance to get a bit more acidity – in my experience this is unnecessary for beers aged more than a year, but can help beers which are intended to be consumed earlier. Those are cell numbers, as determined with a hemocytometer. Lacto is a lot smaller than sacch, and tends to grow to higher density, so by volume it would be quite different. I've found that the 2:5:1:1 ratio does a decent job of producing a sour beer with reasonable complexity. In reality I am likely over-pitching the brett & pedio in that mix compared to something like roeselare or a wild ferment. The only negative thing about this mix is the high amount of lacto – for classical Belgian styles you will want to reduce the lacto or eliminate it all-together (or hop appropriately). These get most of their acidity from pedio, and the lacto acidity has a very different character. For your mixed-culture fermentation ratios for Lacto/Sacch/Brett/Pedio (2:5:1:1), is that cell pitch rate or slurry volume? I am trying to build my own blend from commercial dregs and haven't been able to find many suggestions of microbe ratio besides yours. I would love to hear your experience/results with that ratio! I've not tried the DME + applejuice mix; I tried apple juice in the past and was underwhelmed with the growth. I've not looked at it since (but Sam at Eureka brewing has, with interesting results – link is in the post). Autoclaving/canning DME does tend to create a lot of precipitate, which if stirred up, makes for a very cloudy starter. I've found that adding fermcap s prevents a lot of that precipitate from forming. But it doesn't matter – the yeast don't care that the precipitate is there, and it'll drop out in the beer. 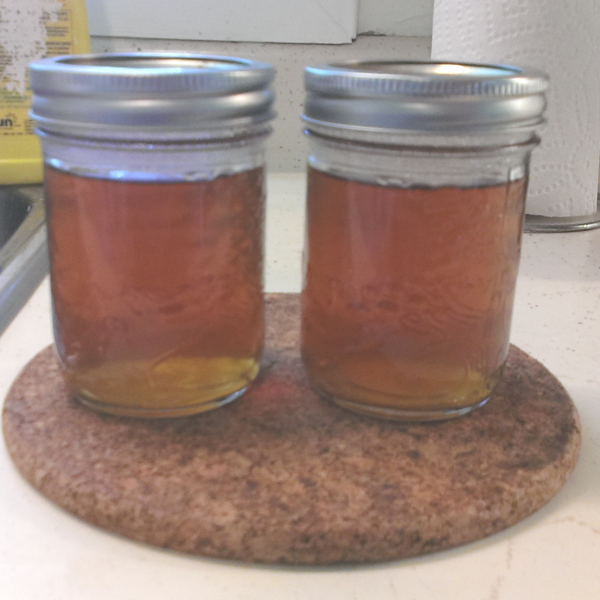 Have you made DME Apple juice media? Did the DME come out cloudy when you sterile do it? Well written and informative. Cheers!